Ir. Salomon BAZIBUHE MIRINDI is a young person concerned with the conservation of Biodiversity in particular and the management of the quality of the environment in general. In April 2017, he defended and obtained a Bachelor’s degree in Environmental Sciences at LWIRO Fifty Years University in South Kivu Province in DR. Congo. Ir. 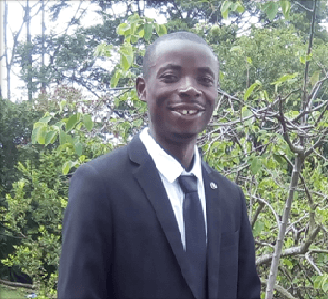 Salomon joined in November 2017 the Young Entrepreneurs Association of Mulungu (AJEM) which is a non-profit organization, where he played the role of vice coordinator and supported the secretary of the AJEM in writing the reports . Since September 2017, he has been secretary of the International Spiritual Educators Service (SIFS) choir based at INERA-MULUNGU. Currently, Ir. Salomon is a member of Primate Expertise (PEx. ), A local non-governmental organization dedicated to the research and conservation of primates in DR Congo. He is responsible for monitoring and evaluation to support PEx in the design, monitoring and evaluation of his projects.